We are on a multiple hike vacation. 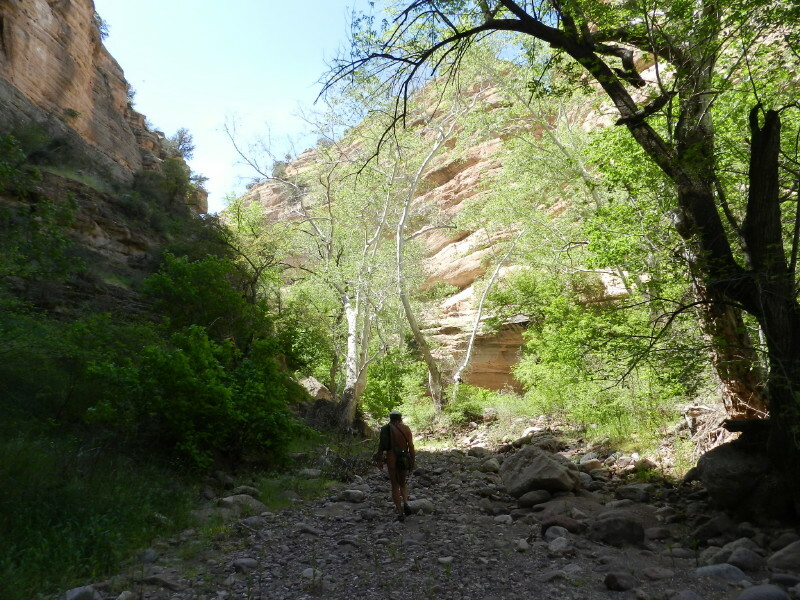 We have spent the previous day in Arivaipa Canyon on a permit and have slept in the tributary called Turkey Creek. I want to know what is further upstream in the wilderness. Remember, You can enhance and enlarge the pictures by clicking on them. We once again climb out of our metal nest early. Our permit has expired and we have to leave. I quickly load our belongings back into the back of the SUV from its storage in the front seating area and the roof. DF tells me to not forget my fivetoes. The VFF’s have been drying on the roof, having been submerged in the creek a great deal of the previous day. The disaster of the lost hiking shoes is avoided. As we are busy breaking camp and folding chairs, a truck filled with people drives by heading out of the canyon toward Aravaipa Canyon. We are covered from view by our own vehicle. Then, another two drive by, all filled to the brim with camping materials and people, even a kid in the back of the bed of one. This is a good sign, for us, we figure. They are emptying out Turkey Creek upstream. 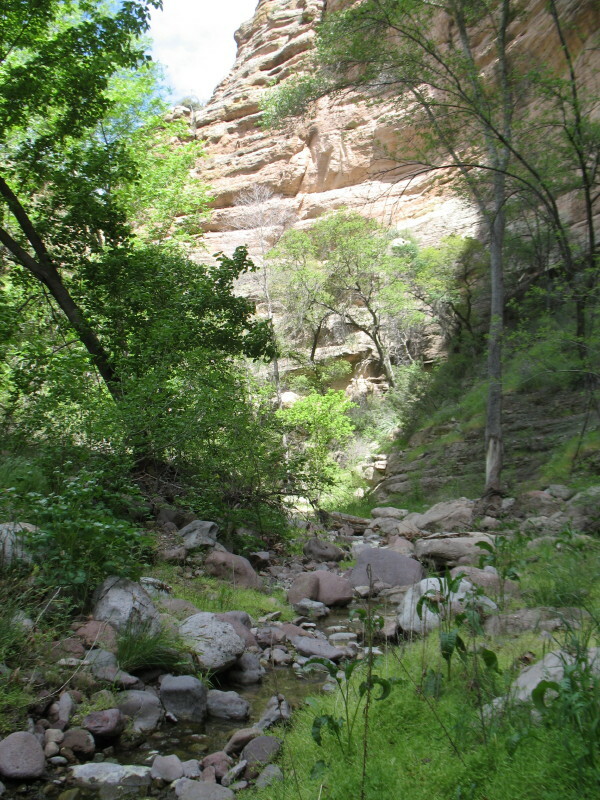 We head up stream into Turkey Creek Canyon on the two track road. Thick foliage is brushing the sides of the truck. The water is flowing. There may be water where we are going. 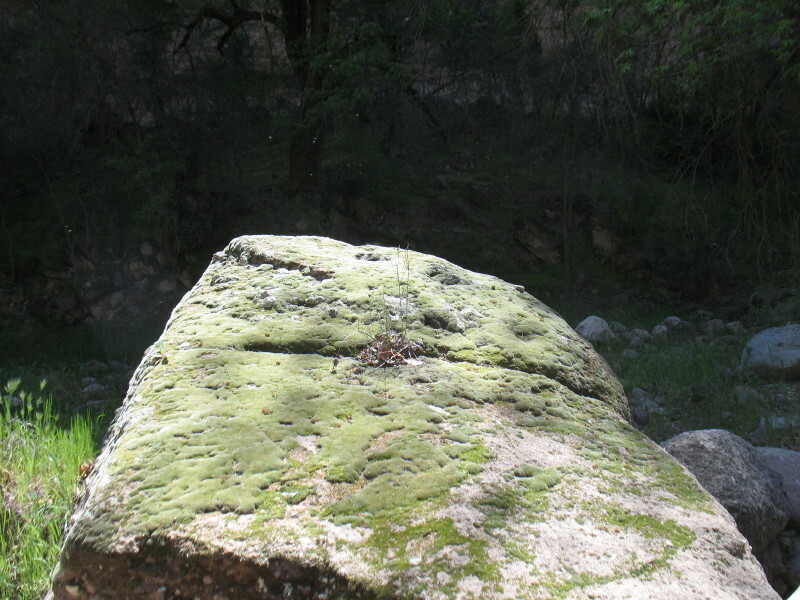 We pass familiar campsites where we once peacefully strolled barefoot all over. It is gorgeous. 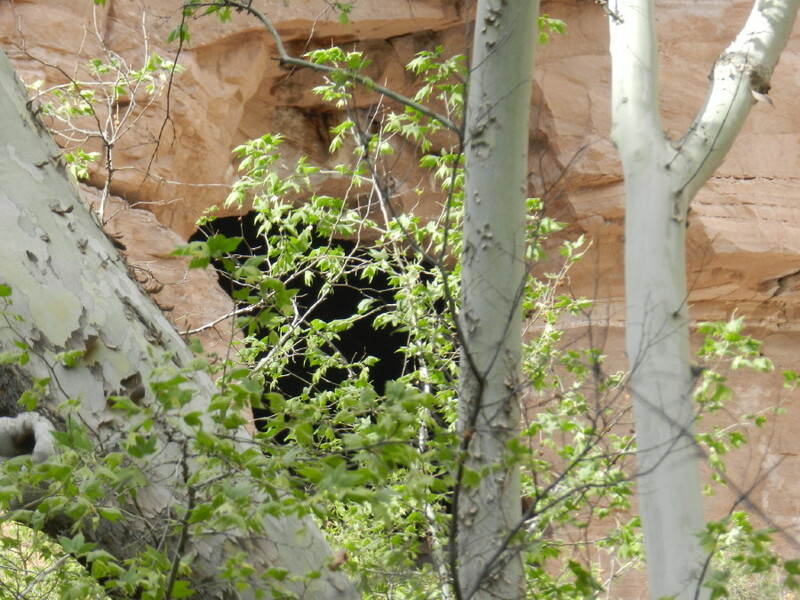 Where the site of the Indian cliff dwelling is, there is activity. An out of shape obese woman waddles off the jeep trail for us to pass. We cover, enough, and then notice an extensive camp set up with three vehicles and a trailer. This must be the base camp for all of the people who had been in the trucks. 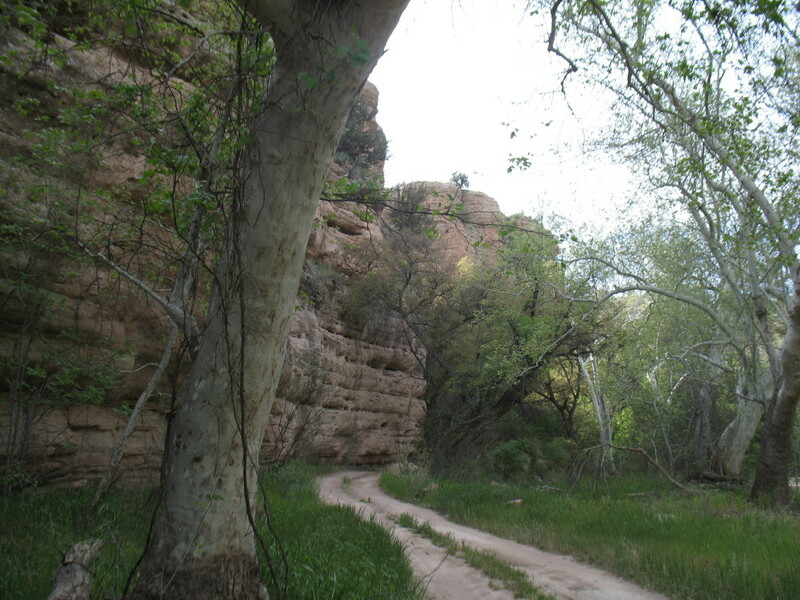 Those truckful’s weren’t leaving; they were heading to hike Aravaipa Canyon. We were lucky to not have had them to deal with the day before. This spot is as far as we have explored. I had checked google maps satellite images. 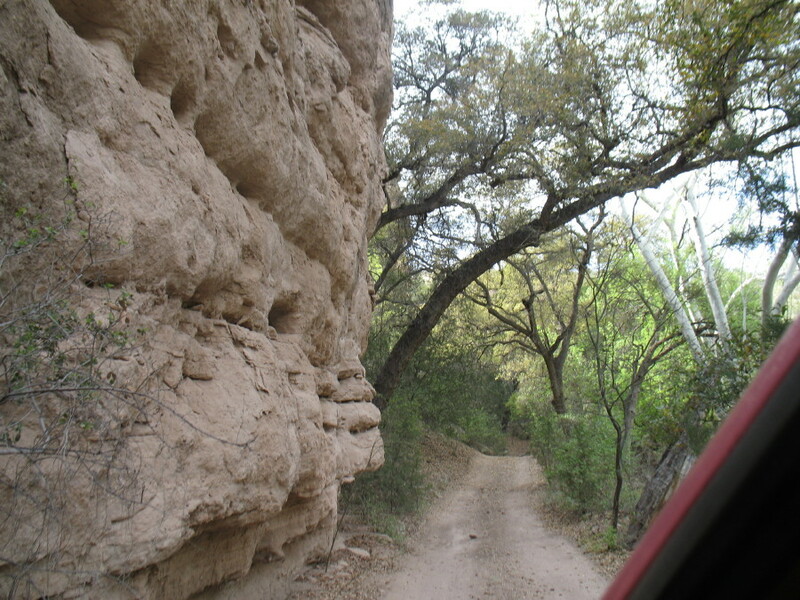 It appears that there is a significant canyon with high walls continuing just as this road begins to ascend up, where it begins to be known as the infamous “Rug Road” the 4×4 killer road. 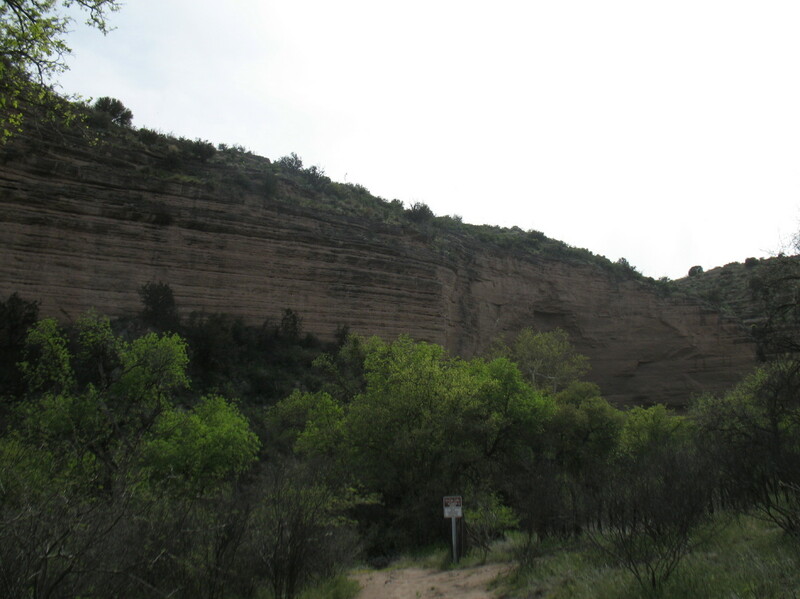 We are heading into the unexplored canyon. I find the spot where a jeep trail heads off into a wash and we continue that way. The water had disappeared a few hundred yards previously, but we didn’t expected any in the first place. 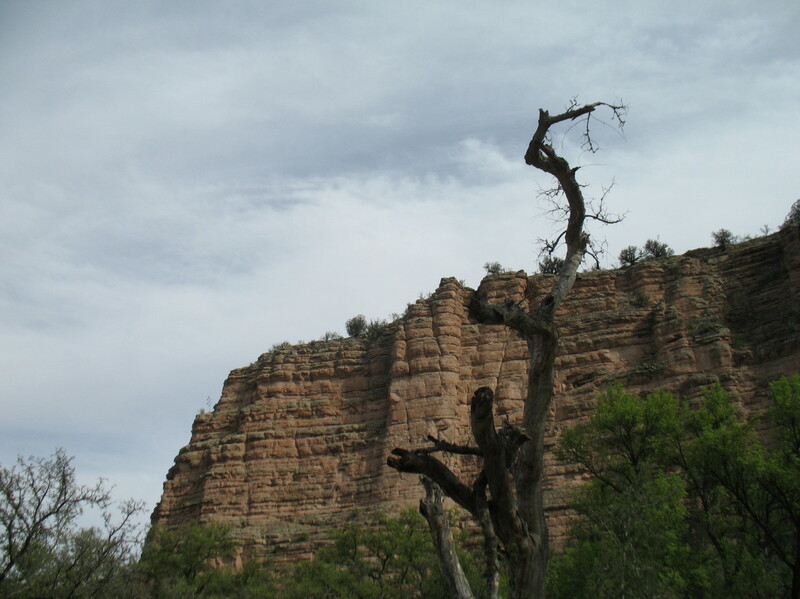 There is a wide expanse in the canyon. It has a fork there, meeting another. We finally arrive at the end of the road, designated with a sign not to continue driving and no hunting, etc. We have a deliberation to make. Do we camp here, or where, if so? Do we drive all the way to Muleshoe Ranch tomorrow? It has been a half an hour drive today, and we are 40 minutes from Klondyke. After that, there are many more miles of dirt road, perhaps three hours of driving. There is no place to camp close to Muleshoe. All of these and other factors and finding a good shady parking spot as a camp are milled through. We decide to luxuriate in a motel in Wilcox after a shorter hike here. 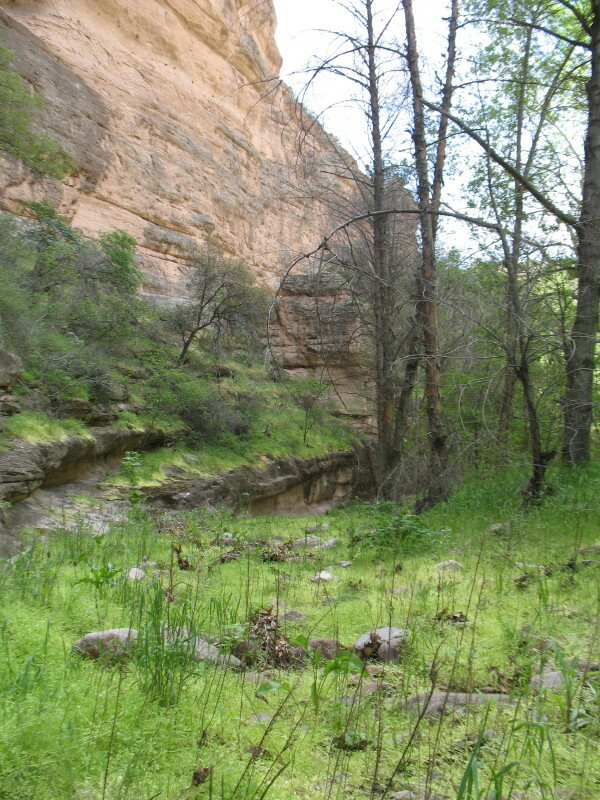 We just don’t expect the paradise that we found down in Aravaipa Canyon. 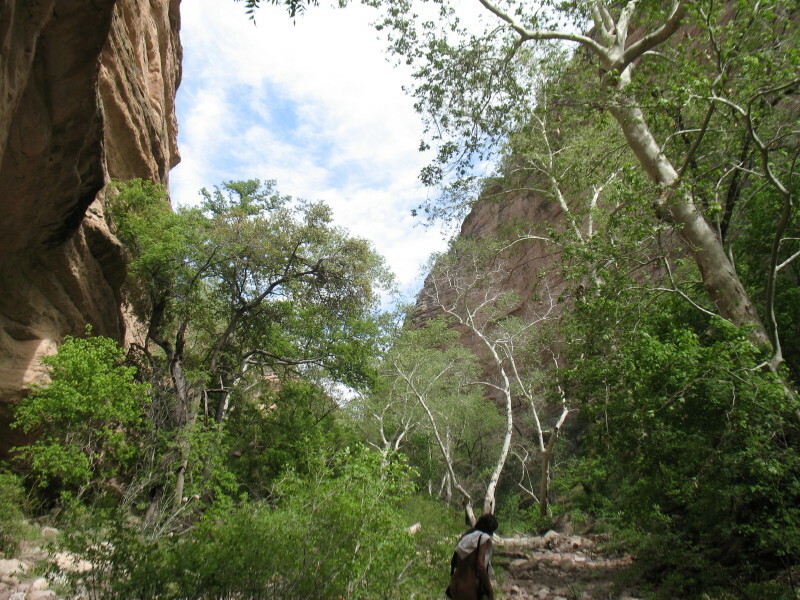 With water, cameras and our shoes only, we begin walking up into the canyon. The rock walls are as impressive and beautiful as Arivaipa’s. We soon discover that this place is not frequently traveled. There is no trail, no tracks and lots of dry river rocks. Obviously water does flow through here in large amounts when it rains. Having spent the last 24 hours stream side, we are astounded by the silence of this massive place. Birds speak here and there, sometimes the wind, but there is a divine silence here. We have to walk quietly, step by step, taking care not to miss-step on the round rocks, or find balance lost on an unstable one. Our steps reflect the silence. We decide to only whisper to each other, and that becomes infrequent. We are focused in our moment, balancing, stretching, taking every carefully laid out step as a plan and then stopping to stand in awe, smile at each other and share this amazing place, naked. 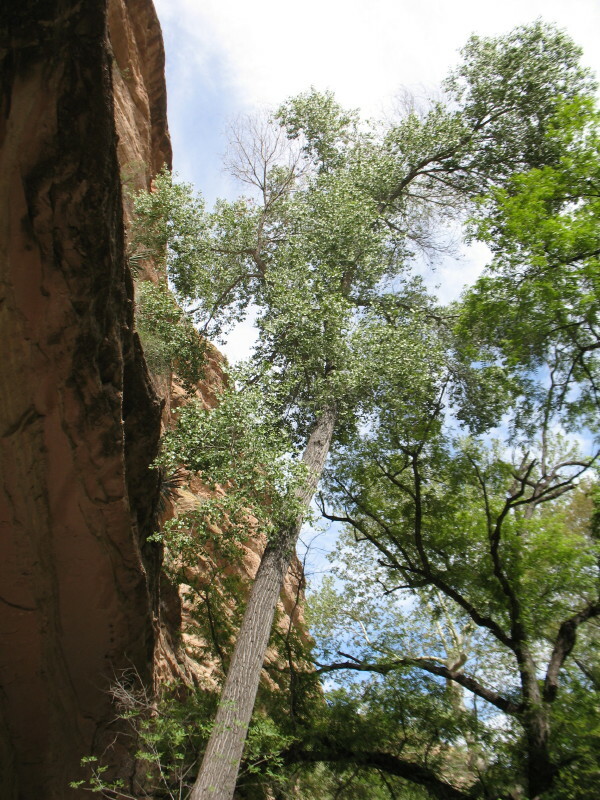 Photos are being taken, but many are left undone because the thin canyon floor and tall walls can’t fit into a lense. Other photos are abandoned, simply because I just can’t do the place justice with a camera. Something very special has overtaken us. In a bend, we are walking through a shady area where the sun is only allowed to shine a short few hours a day by the thin floor and tall walls. In these spots there is more vegetation. There is a coolness in the still air and we come to a pool of water. 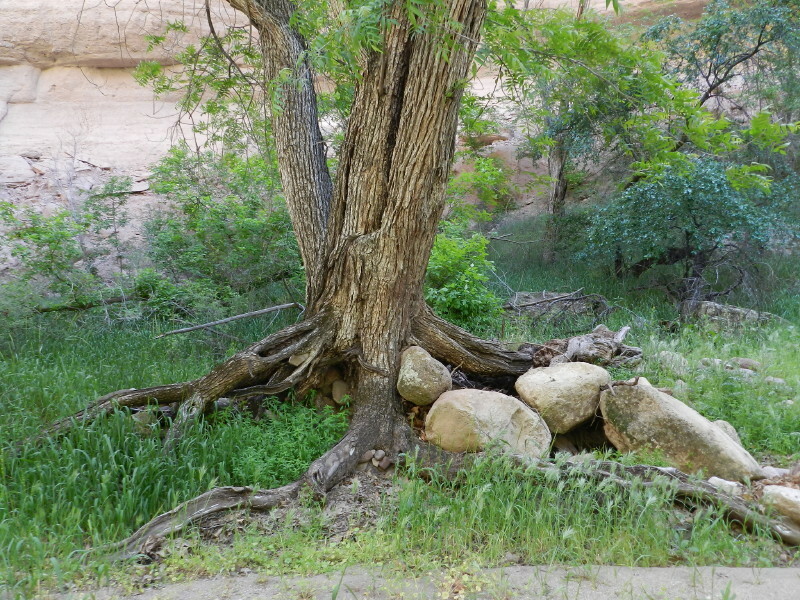 It seeps up out of the canyon floor into the river rock. 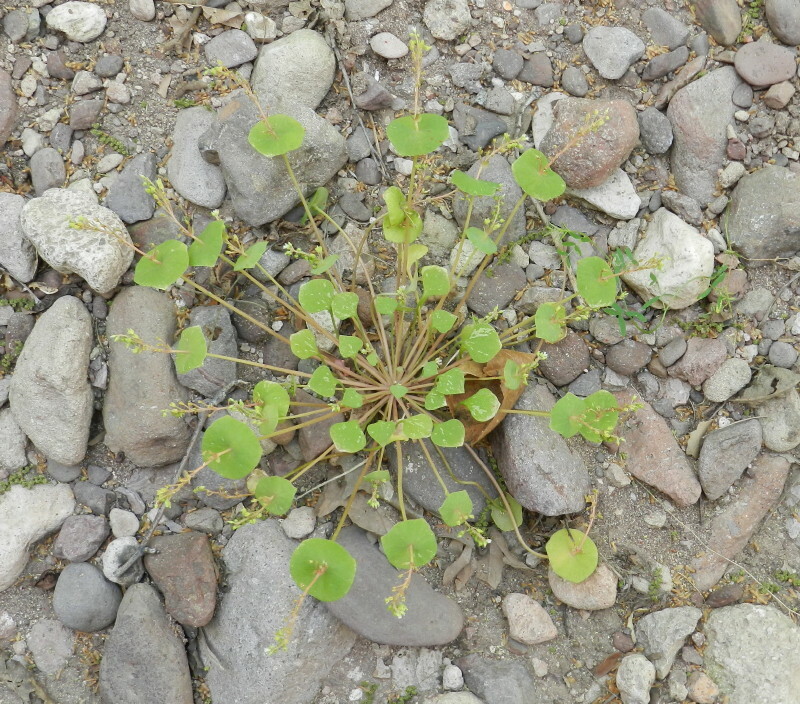 A green vine-like cover, like a carpet of clover, is before us, wall to wall. This is undisturbed. Nobody has been back here for quite some time. It is pristine. Suddenly, DF tells me that she doesn’t want to go further. She says that it is too pristine to destroy it. She wants to leave it alone, as if it were a singular beautiful flower that should not be picked. There is no way around. My reasons to continue are actually not better than hers to leave nature as it is. Still, we have some more time to explore. Have you ever encountered something in nature that just should not be taken, interfered with? 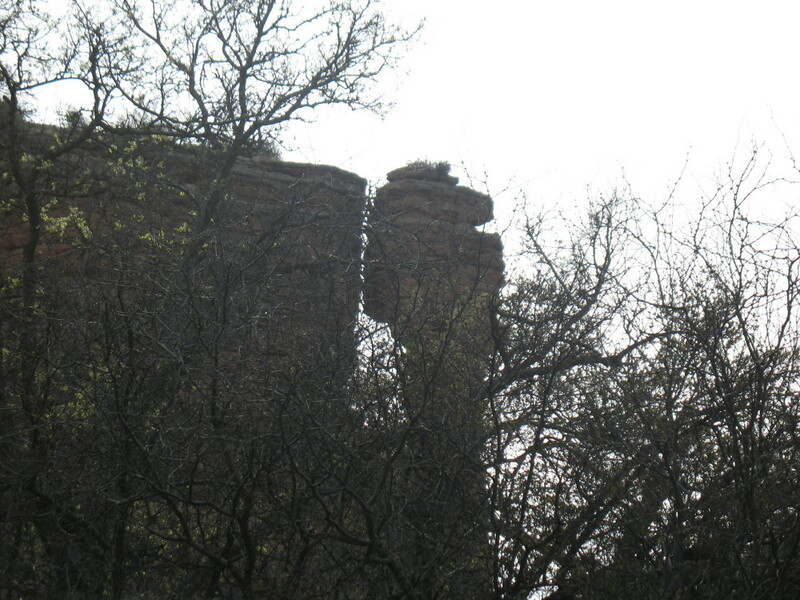 It is something within that causes National Parks and Wilderness designations.You just know. There, in this piece of watery stream is a boulder, just good for two to sit on. This is a special place, a special energy, a place where others, not human, stay. Just above, next to a log, the plant-life is matted down where a large animal had been lying, as it watched the waterhole. I imagine a large spotted cat waiting for its prey. There are a few insects buzzing there, attracted from the animal’s stay. And still, there is quiet, silence. 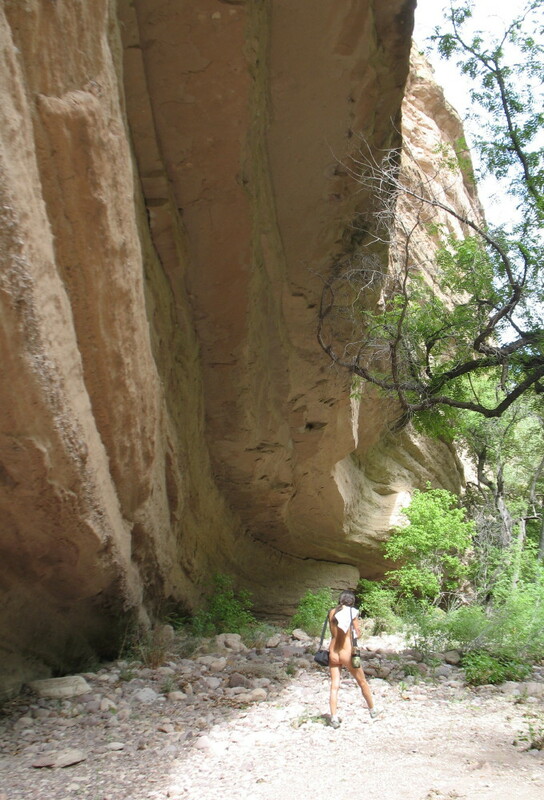 There are other places to explore besides the next bend in a canyon. We sit quietly. We eat our snacks and drink. I’m able to cross my legs with the slope allowing my back to stand comfortably erect. This place feels safe. We meditate. Closing my eyes, I feel things release, I feel tears. The last three days, there has been mourning, grief popping up. It has been those things that still linger, the grief that takes time. My mother’s birthday, identifying with scenes in the movie, things get triggered and like this spring of water, come to the surface. This feels like some of that. This is a good safe place, it nurtures me, holds me. Sensations rise from below the base of my spine and then crawl up the spine and body. They are like a shiver, or a chill. There is peace, and sadness, then restlessness, and again peace, inward and outward…. The watch tells us that it is time to return, but not to hurry. 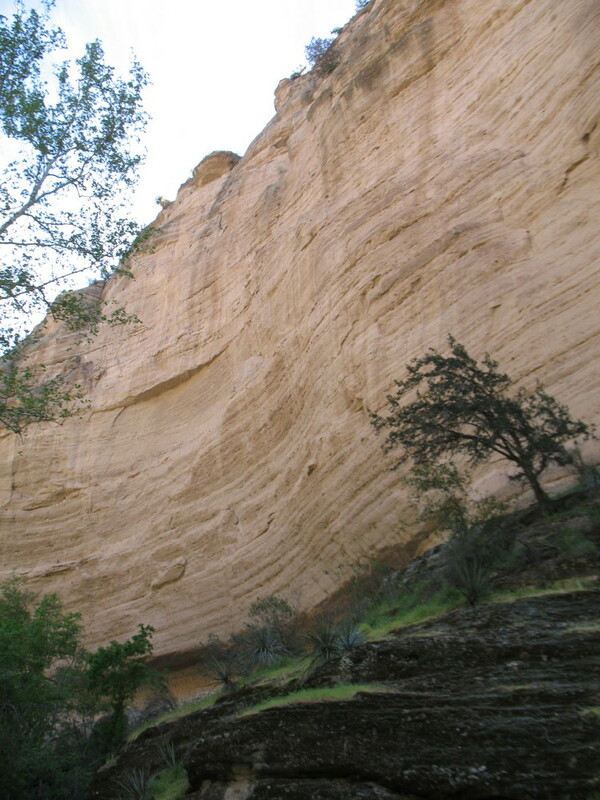 There is a long drive ahead, and we must prepare for the next day, but for now, we are here in this canyon. The walls consist of layers made from the compression of thousands of floods depositing slit and rocks atop of each other in other eras. There are conglomerate formations everywhere and beneath our feet. It is a gigantic layered cake that an even bigger knife has sliced through. It is amazing. All of this from swirling tides from millions of days. The crumbs from the cut are beneath our feet. Lunch, a feast of a salad and too many gnats awaits us. We travel slowly back through and reluctantly leave this paradise for a new adventure. Many miles of dirt road and then the highway later, we find a cheap motel in Wilcox. We dine out in a Mexican restaurant. We get served just under the line near closing. The streets are rolled up very early here. We return, undress and spread the contents of our backpacks out across the wide bed. We sort and plan our strategies. We are heading into a pristine wilderness preserve tomorrow…naked.